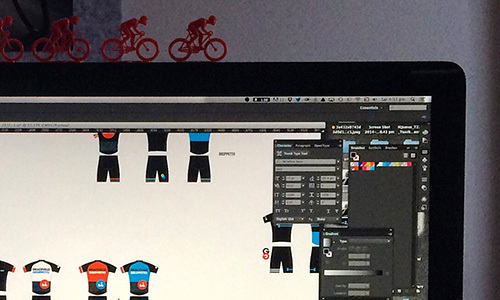 I am in the process of designing new cycling kits for the cycling group I ride with – Graceville Gruppetto. I met with the kit manufacturer this week to look at garment options and discuss production. Looking forward to getting these out on the road – very exciting. I have also started work on the creative direction for a corporate report for an Aboriginal Youth Development Corporation based in remote Western Australia. The images came through from the client and there are some stunning images depicting the community. I am really enjoying combining the imagery with some hand drawn typography. Initial proofs came back for the A3 fold out strategy piece I am working on with an information management client. I have used some very abstract iconography on this one so it will be interesting to see how it is received when it is presented and their board meeting next week. At long last I am getting stuck into David Hieatt's (Howies, Hiut Demin, DO Lectures) latest book DO Purpose. Tons of great insight and inspiration for those wanting to build brands that matter and people actually really care about. Aside from the great content, the book itself is beautifully proportioned, designed and produced. On the podcast front Paul Jarvis – The Freelancer – continues to put out insightful stuff. In his latest podcast, he discussed the value of client testimonials to your business and the benefits conducting end of project calls with your clients to discuss the outcome and process. A simple but important habit to get into. Getting my 80s and 90s on a bit this week – Echo & The Bunnymen, New Order, Depeche Mode, Stone Roses, Oasis. A bit of Nick Drake and a fantastic young songwriter from NZ–Marlon Williams. Oh and a bit of Custard for good measure.